The original Star Wars: Dark Forces was released back in 1995. The game is a FPS that takes place in the universe created by the Star Wars saga. It had long levels and impressive cinematic sequences for its time, good graphics and also featured awesome music and sound effects. In short, it has a great replay value, so after almost 16 years, why not play it (again)? Since this is a DOS game, you will need to use a emulator to play it, such as DOSBox. The game works fine with the emulator. 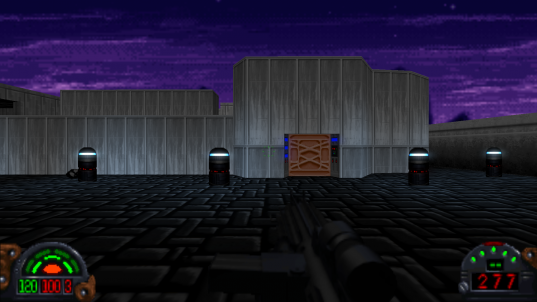 DarkXL is a Hardware Accelerated remake of Dark Forces. It requires the original game data, and will fully support the original game – with cut scenes, briefings and other features. 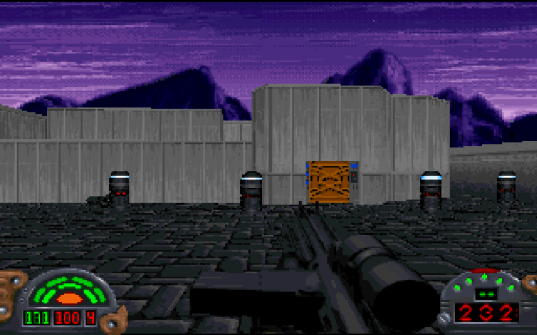 Screenshot of the original DOS version. This is how the same level looks on DarkXL. Additionally, there are some other features that makes the game feel more contemporary, including revamped controls, the possibility to aim up/down with the mouse, a selection of crosshairs to choose from and a new options menu to tweak every setting. DarkXL is still on the alpha stage of development, but already shows a lot of promise. According to this post and the roadmap on the official website, DarkXL will have, in the future, multiplayer support – a game mode that wasn’t included in the original title. And according to these posts, it will also support two other great FPS games: Outlaw and Blood. Amazing! I found your blog post because I want to replay the best Dark Forces version that I can. I choose DosBox with MIDI soundfonts and graphical filters, but DarkXL seems to be the ultimate way to play the game another time!